Sandra Wilson wrote “Hurt People Hurt People” to provide practical counseling to individuals that have past hurts and have created hurtful patterns in their life because of this. 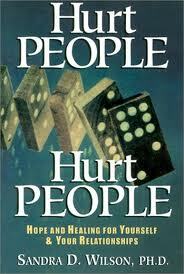 This is a topic suggestion on Hurt People Hurt People from Paper Masters. Use this topic or order a custom research paper, written exactly how you need it to be to assist you with your psychology or sociology project. Human relationships and why individuals cannot break free from the pain of past hurts. Hurt People Hurt People looks at emotions such as blame and fear of change as a few of the barriers to healing that many people experience. Sandra Wilson’s self-help style of writing calls upon her faith to supplement psychological counseling. She states that people need the “best of both worlds” to fully heal. This means they must use their faith in God and the psychological counseling she advises to address their mental health disorders or issues. Wilson uses the example of Jesus counseling all types of people and at any time of the day. It is the goal of Christian counselors to be like Jesus Christ and provide their services for all people. Wilson’s book offers guidance to people of all walks of life and any culture. Paper Masters can help you understand the meaning and the direction that “Hurt People Hurt People” takes and outline clearly Wilson’s steps for achieving mental health through God. Order a custom model research paper on the book and Paper Master’s academic writers will explain exactly how to integrate Wilson’s counseling technique into your studies. The Bible and Counseling - The Bible and Counseling Research Paper looks at how the Bible can be integrated into various counseling topics. Biblical research is available at Paper Masters. Christianity and Psychology - Research papers on Christianity and psychology look into the ways spirituality can affect a person’s life when seeking an integration of faith and science. Counseling Techniques - Counseling Techniques research papers discuss a number of different counseling techniques employed in the field of Psychotherapy. Sandra Wilson Counseling - Sandra Wilson is a well-known Christian Counselor that uses secular and Biblical approaches in her counseling practice. Counseling Relationships - Counseling Relationships Research Papers look at an example of an order placed on a counseling project with specific requirements into values, attitudes, and behaviors in regards to counseling. Philosophy and Ethics - Philosophy and Ethics Research Papers discuss what people believe, such as religion, which offers rules of morality that they feel they are obligated to follow. Paper Masters writes custom research papers on Hurt People Hurt People and discuss Wilson’s counseling techniques.